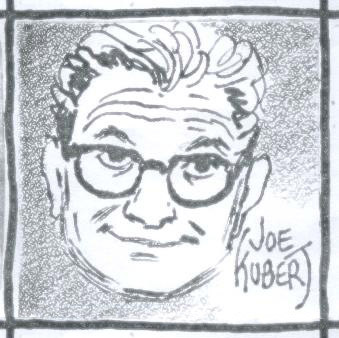 I’m rounding off my tribute to Joe Kubert this week by reminising about the last time I saw Joe. It was just this past spring at the Chicago Comic and Entertainment Expo. The following video is Joe sketching Nite Owl from the new Before Watchmen series. The image was projected sideways on a large screen – my video is rotated to one side so the drawing can be seen correctly. While Joe sketched Anthony was fielding questions. What amazed me during Joe’s drawing demo was that every time Joe was asked a question instead of Anthony (and this is not seen on the video) Joe was so focused on the drawing that Anthony had to repeat the question numerous times just to get Joe’s attention – repeatedly – EVERY time. Joe finally apologized repeating what he had said moments before – that when he’s drawing, that’s where he’s focused, so he’s not listening to the conversation going on around him. After the drawing demo Joe stayed for a short time to meet and greet fans. I went up to say hi and the guy standing in line in front of me told Joe he was a huge fan, then asked for Joe to sign his arm so he could then get the signature tattooed. The fan persisted and Joe kept protesting until the guy’s friend explained it wasn’t a spur of the moment thing, that his friend really was that big a fan. This last little clip is of Joe signing the fan’s arm. My time with Joe was relatively brief. It had been years since I had seen him last, but he recognized who I was after I mentioned the Flash Gordon page we had worked on. A smile lit his face and his strong handshake followed. He asked me what I had been up to and I told him about my freelance and teaching. That warm smile again and the handshake. And that was the last time I saw Joe Kubert. There’s more to say, much more, but I’m going to leave it at that. My thoughts and prayers go out to his family and friends – he’ll be sorely missed. This entry was posted in Artist Spotlight, Artists - Cartoonists, Conventions, Joe Kubert and tagged Anthony Marques, Joe Kubert, The Kubert School. Bookmark the permalink.